Nicholas Nickleby is an imperfect film. Any movie that tries to cram an entire Dickens novel into just over 2 hours is destined to be imperfect. Nevertheless, writer/director Douglas McGrath makes a valiant effort that focuses on fun. 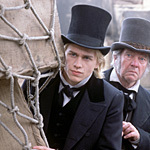 Based on Charles Dickens’ novel, Nicholas Nickleby follows young Nicolas (Charlie Hunnam), who turns to his uncle for help after the death of his father. Uncle Nickleby (Christopher Plummer) finds work for Nicholas’ sister Kate (Romola Garai) and their mother at a dressmaker’s, and he finds a job for Nicholas at Dotheboy’s academy for boys. The headmaster at Dotheboy’s is the cruel and deformed Mr. Wackford Squeers (Jim Broadbent). Mr. and Mrs. Squeers treat all the boys cruelly, but one in particular draws their scorn, Smike (Jamie Bell), a cripple. Nickleby tolerates the Squeers’ cruelty as long as his moral compass allows, and then he leaves, taking Smike with him. They hitch up with a gay band of traveling actors (led by Nathan Lane and Dame Edna) before coming home to London to reunite with Nicholas’ mother and sister. Uncle Nickleby has been inviting his friends to make unwelcome passes at Kate, so Nicholas severs their ties from their uncle. Meanwhile, Nicholas finds work and love in the city, Smike takes ill, uncle Nickleby plots against Nicholas and Kate, and a mystery man appears with some sort of dark secret. As you can see, McGrath managed to pack a lot of plot and dozens of characters into two hours. His screenplay is complex but never hard to follow. Where necessary, music glues together disparate scenes, and elsewhere the score (by Rachel Portman) adds a touch of class. All in all, Nicholas Nickleby seems like a great achievement. In fact the film is very good, but it shows its seams. Dickens writing isn’t subtle, and although he was a good storyteller, his works seem almost childish at times. There is little room for emotional or thematic depth among the dozens of characters and half dozen plots. McGrath emphasizes this shallowness by playing each scene for its own sense of camp, fun, sadness, or rage, without regard to an overriding theme for the whole movie. It feels like he’s pandering to the audience, particularly when the entire cast is either freakishly good-looking (Hunnam), hamming it up (Lane), or a favorite British celebrity (Timothy Spall). But McGrath’s choices are also what makes the movie so much fun. Playing each scene for all its worth makes each scene a gem, even if it’s only linked to the whole by a musical score. Casting charismatic and hammy actors makes the on-screen chemistry spark into life. The result is a movie that’s a joy to watch. Villains are villains. Heroes are heroes. Beautiful young women fall in love with handsome young men, and the poets look on with fondness and nostalgia. Nicholas Nickleby is a good time at the movies in the guise of serious literature.